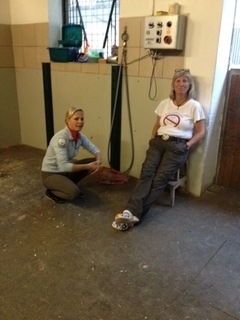 Dr. Uschi Barth will go with us to the Olympic Games in London/GBR. Our veterinarian, who comes from Vienna, has been taking care of our horses for many many years and she knows Augustin OLD since he was born. She was always there at the large shows and championships and it feels comforting to know she's with the team again. Why Uschi looks so tired in the picture here, I don't know. After all, the packing and loading of our equipment for Londen only took a couple hours and it sure felt like we walked at least 50 kilometers back and forth between the stables and the van ... but maybe she is only thinking hard abut the question we are all thinking: are we sure that we haven't forgotten anything?? ?